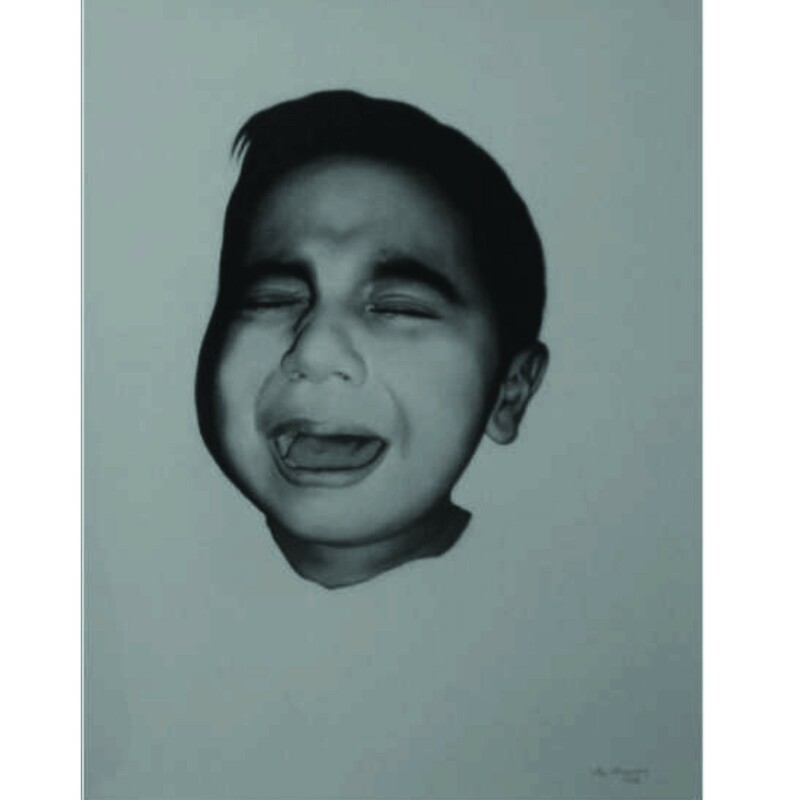 Ali Karimi’s solo exhibition ‘Manifestations’ comprised twenty six pieces of graphite drawings which was welcomed as a breath of fresh air, essentially due to the choice of medium which is not commonly displayed at art galleries. 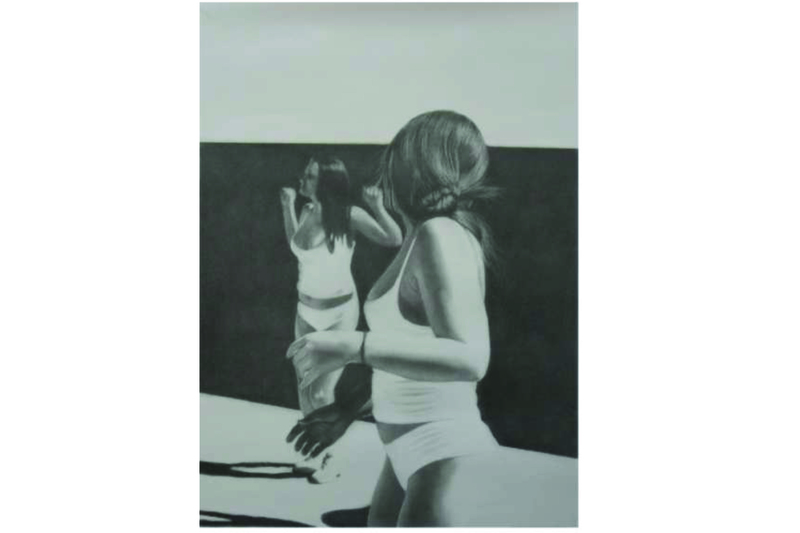 In addition, the subject matter of these drawings was highly individualistic, exhibiting an eye for detail and a celebration of human form and structure. The much glorified female form was the centrefold theme running across many of his pieces, which may also find many a little past their comfort zone. 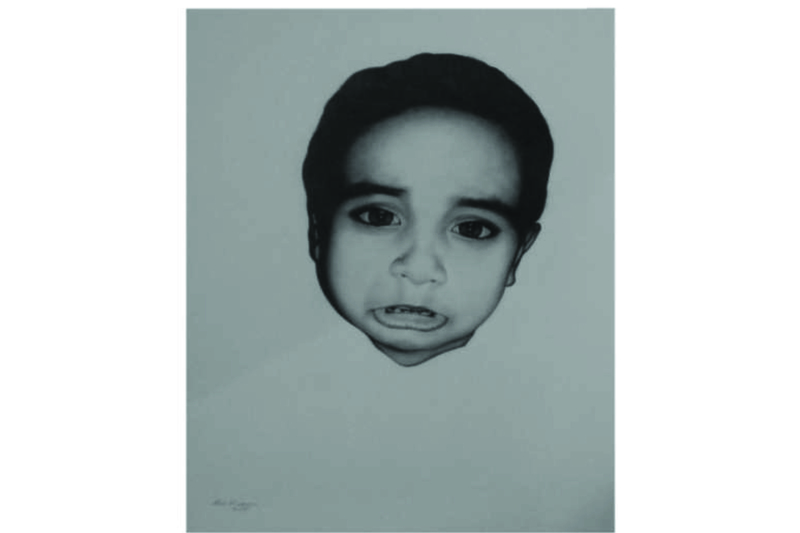 Almost all of the sketches were done as graphite on paper, except one that was an untitled triptych on wasli. This soulful triptych had intensely rich, black hair done up with mainly charcoal with empty thought bubbles popping up-top the subject’s head, leaving it open for the viewer to plug thoughts which resonated with them on contact with the artwork. It is commendable how the shadows and highlights worked seamlessly to appeal to the eye, especially considering how wasli is not forgiving to graphite as a medium, as much as a regular art paper normally is. Karimi also spoke about selectively using “blade” on paper for carving out the texture and highlights through the sea of charcoal and graphite, with one blade lasting merely for a handful of strokes. The detail which indeed has been artfully carved out by this immensely talented artist. Inspired by Carl Jung, a few of Karimi’s pieces incorporated the concept of “shadow” referring to the unconscious mind which is handed over the task of dealing with certain repressed aspects of our identity which like the iceberg is submerged mainly below the surface of the water, leaving atop the water surface, just a small piece of the entire story underneath. In order to deal with the things which our conscious mind finds taboo or immoral, the fastest way the mind finds, is to pretend that those things do not exist. Inspired with this thought process, were the drawings of silhouettes of male and the female form incorporating the Yin and yang contrast, being the thin line between the good and the bad which is what every human experiences at some point, facing their unique moral dilemmas, wanting to be mighty-good at all times and then being overbearingly disappointed with “the unconscious self” which the conscious mind does not recognize. Such is the ego which has a job to do, keeping societies in line and making sure that trains are running on time without any disruptions at large. 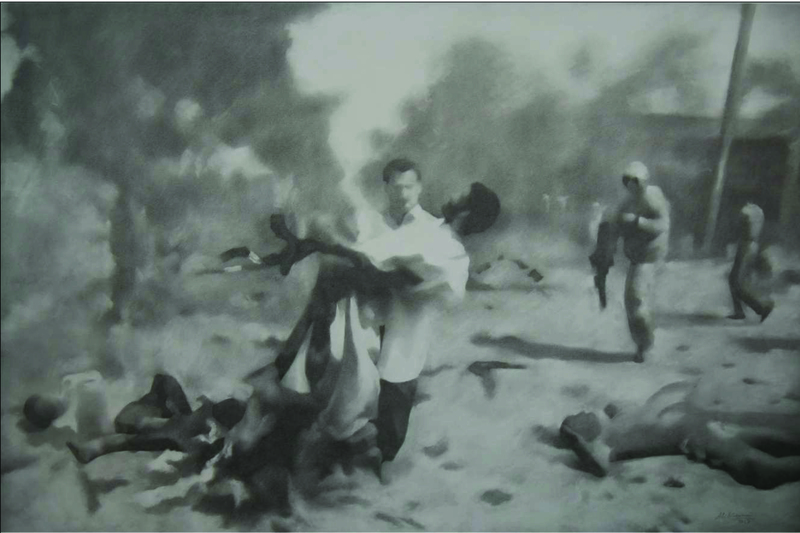 A few of his sketches depicted the violence in its raw entirety, leaving one to wonder what all humans may be capable of. As something which we see and hear around us, the chaos and then the eventual devastation which comes with violence was also depicted. Not a drop of blood in colour, but the trauma that it brings to human kind was a tangible two dimensional experience for the viewer. Existence of violence in human societies has been observed since time immemorial. Even as hunter gatherers our fore fathers were apt to various forms of violence. World renowned Tony Robbin’s theory of 6 basic human needs, provide a superbly thoughtful insight in to how people are always trying to meet these six needs, with violence emerging as a result of attempting to meet those needs which are universal across cast, creed, colour, gender, culture, religion and geography. Perhaps, Carl Jung’s theory of the collective unconscious may have inspired the artist at some point too. Fleeting film scenes were on display which was turned into sketches by the artist. 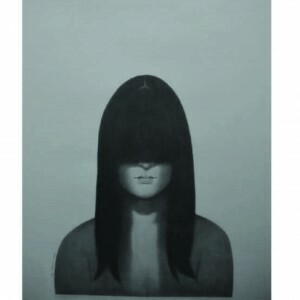 A movie-still, transformed to a black and white image with graphite and charcoal, left its viewer wondering about the original colour frame. A powerful contrast is greeted when movie stills of old Lollywood movies were seen hanging right next to the Hollywood cinema stills both presenting an antithesis of two far apart worlds, which also felt cardinally woven together at a very basic instinctual level. Certain portraits were created with vivid imagination by the artist; one being the self-portrait and another being the shadowed photograph of a nurse in uniform. Visibly commendable use of the medium for carving the direction of light with its looming shadows and a smartly placed reflection tricks the viewer in to perceiving two separate subjects in the frame instead of only one subject with the reflection in the mirror that it was. The crispness of the white uniform being lit by a directional light source, transcribing straight from imagination does indeed require a visual thought process that is uniquely convincing in its perception. The training in Miniature Painting of course is no easy feat, leaving the artist with an eye for colossal detail and a patience for the artistic process as was highly evident in his show. Happy to hear !Thank you . add forums or something, website theme . a tones way for your customer to communicate.